Autumn has landed and we’re at that wonderful time of year where everything seems to glow with warm, golden colours. Autumn is also a time for trends, and this year’s autumn/winter catwalks have been bursting with seasonal accessory must-haves. 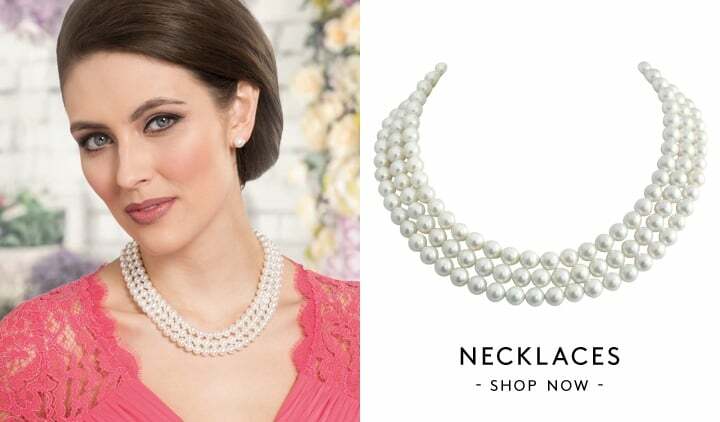 Here are our favourite autumn jewellery picks from this year’s line-ups, complete with inspiration and suggestions on how to get the looks using the Eternal Collection jewellery range. 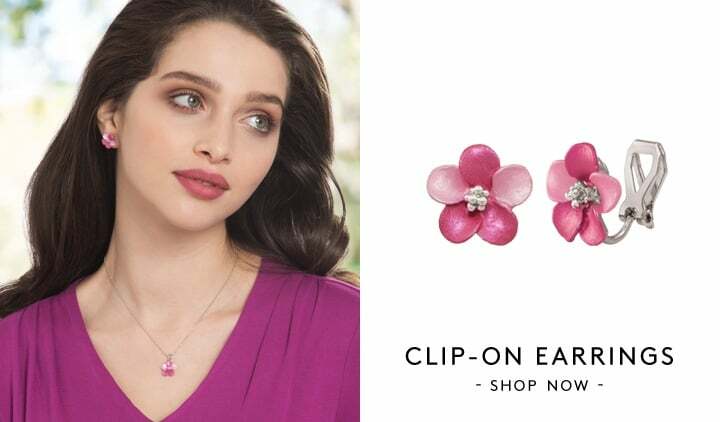 An autumn jewellery collection simply wouldn’t be complete without leaves in our opinion, and it seems the designers agree. This year’s autumn/winter catwalks have seen a scattering of elegant leaves and foliage crafted from precious metals and gemstones, creating a truly autumnal look. The designers have also been pairing their lovely leaves with rich autumn colours like deep greens and vibrant reds to keep the seasonal theme running through the entire ensemble. 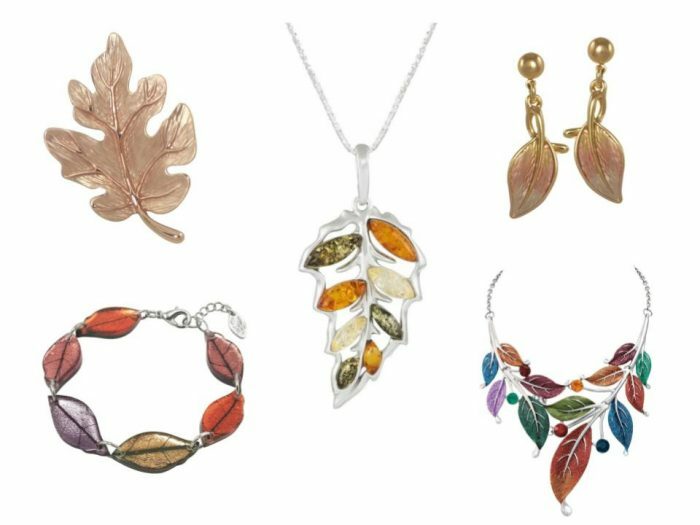 Here at Eternal Collection we’ve been busy creating our own leaf-like autumn jewellery collection to celebrate the season. 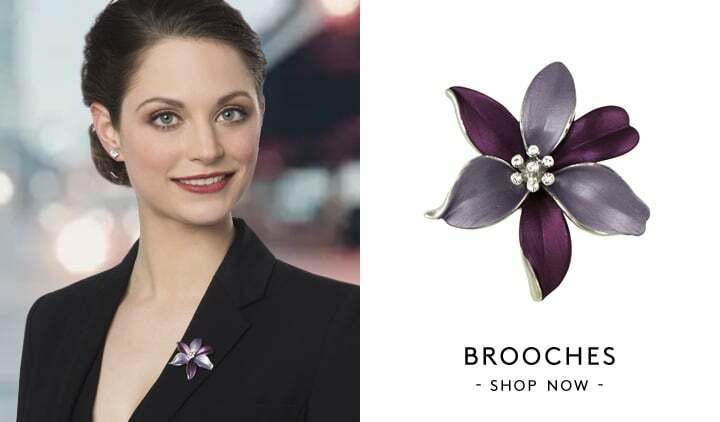 From elegant women’s necklaces and subtle earrings to statement brooches and colourful leaf bracelets, our range of autumn leaf jewellery encapsulates all the beauty of this golden season. Try our Autumn Leaf Amber and Sterling Silver necklace for a touch of bright autumn elegance or adorn your wrist in seasonal foliage with our Laurel Apricot Leaf Fashion Bracelet to get on board with this autumn jewellery trend. 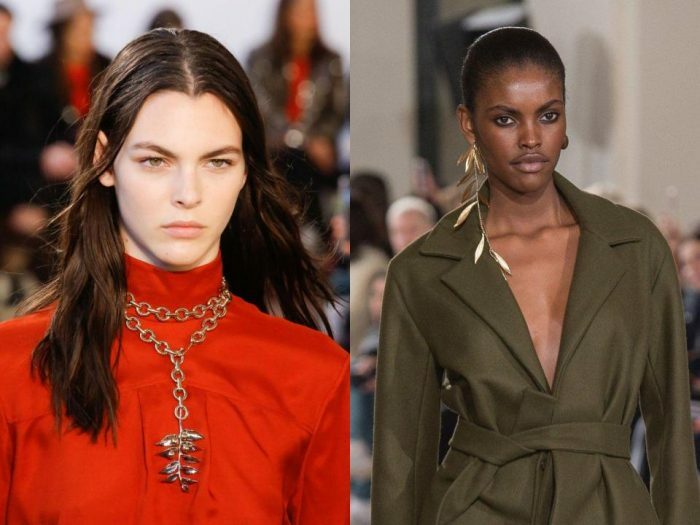 Autumn and winter is the perfect season to break out the chunky jewellery, and this year’s catwalks have been loaded with all sorts of delightful, supersize pieces. 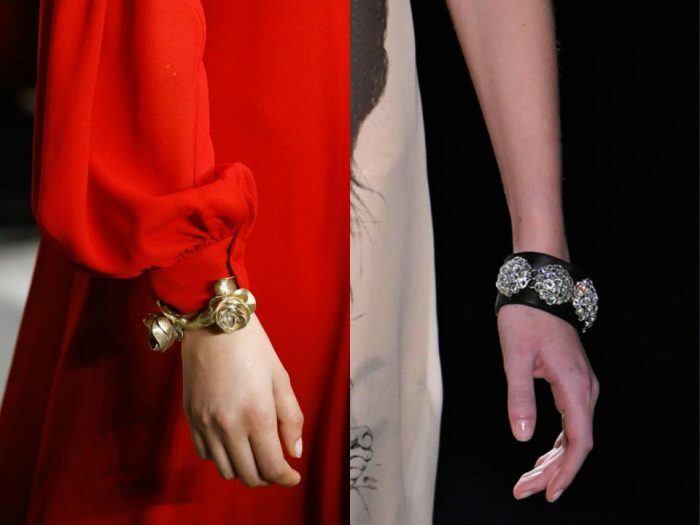 Our favourite style this season, however, has to be the chunky cuff, with everybody from Christopher Kane to Gucci and Giambattista sporting these accessory must-haves on the autumn runways in 2018. The chunky cuff is the ultimate piece of statement jewellery for the autumn season, allowing you to elevate a plain outfit into a stylish and well-considered ensemble. Loving this trend? We certainly are, which is why the Eternal Collection bangles and bracelets range is bursting with treasures to help you mimic the chunky cuff look. 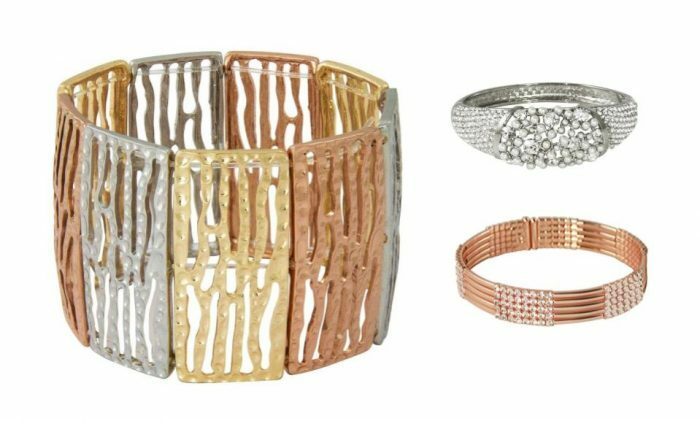 We’re enhancing our cuffs collection with another autumn trend that comes around every year; mixed metals. By blending the naturally autumnal-looking rose gold into your jewellery box you can celebrate the autumn season in extra rich colours. Cuff-style pieces like our Sassy Three Tone Stretch Fashion Bangle make the ultimate chunky statement while effortlessly mixing metals for a truly unique look. 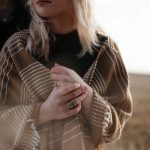 You can conquer two of our favourite autumnal trends in one fell swoop if you team up the chunky cuff trend with stacking. 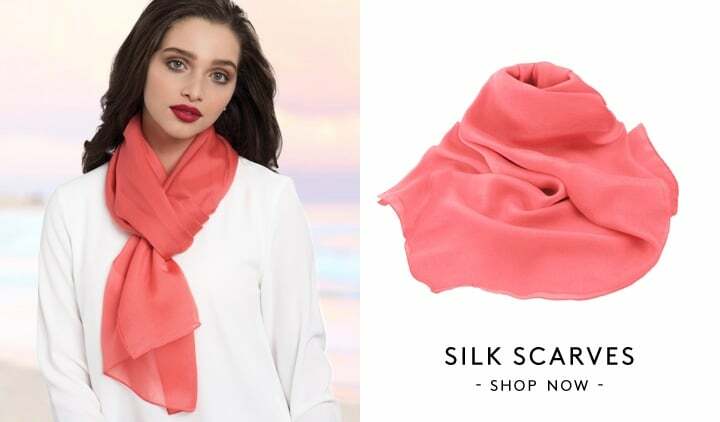 Some of the biggest fashion houses in the world have been showing off their best new clothing pieces alongside stacks and stacks of beautiful bracelets, bangles and cuffs. 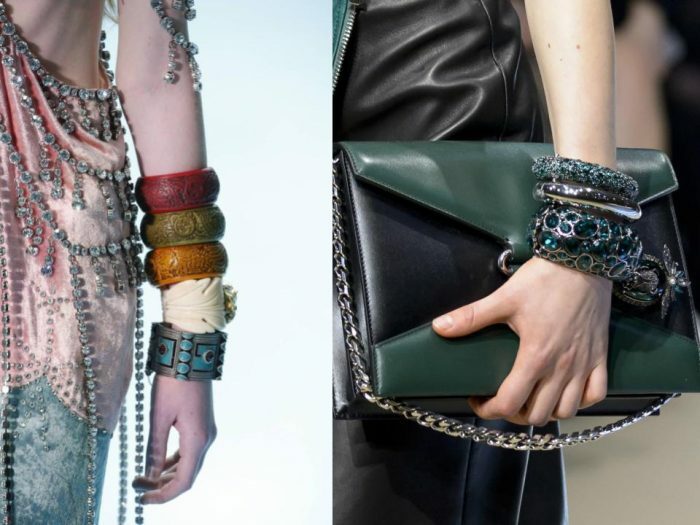 Gucci paired up stunning beaded dresses with multi-coloured wooden bangles, while Alexander McQueen added bejewelled cuffs in deep greens and dark silver to leather outfits to create extra drama. 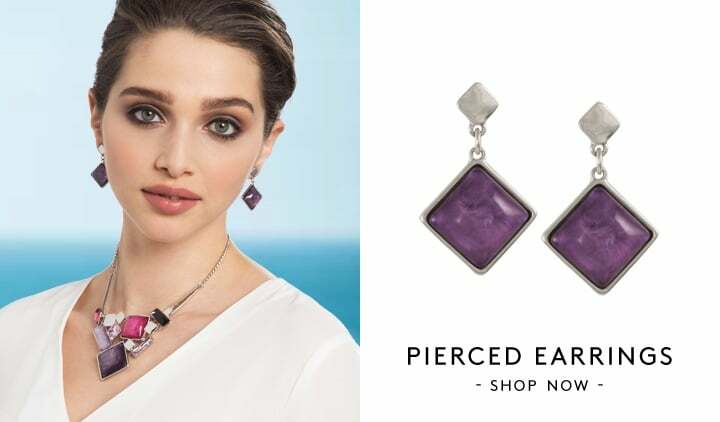 Mixing styles as well as colours, the stacking trend lets you explore all your favourite metals, gems and styles at the same time. If this trend is a little bit of you then you’re in luck; the Eternal Collection bracelets and bangles range is brimming with stackable pieces for you to explore. Our Disco Duo Crystal Double Row bracelets give the effect of ready-stacked styles, and are available in rose gold, yellow gold and silver plated designs so you can mix all three for extra drama. 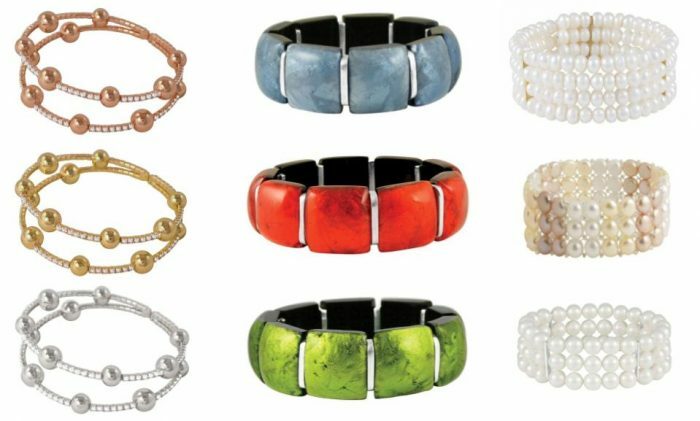 Our super chunky range of Plaza resin bracelets are also perfect for stacking up in three colours, much like the Gucci example above, as they are available in green, blue and red designs. 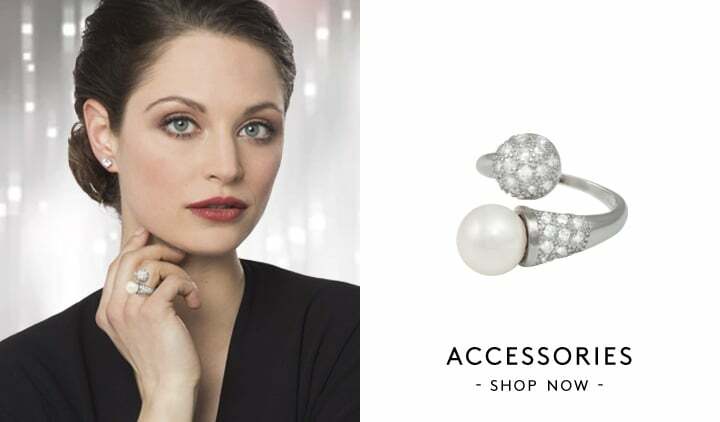 Or, if you don’t fancy buying multiple bracelets, you can get an instant stacked effect with an elegant multi-row pearl bracelet. What’s your favourite autumn jewellery trend? 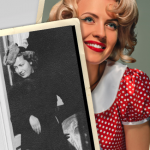 Show us your seasonal styles and trend-spotting updates on our social media pages below!